Korean Intellectual Property Office (KIPO) Acting Commissioner Kim Tae Man is attending the annual World Intellectual Property Organization General Assembly this week. In that context, he sat down with Intellectual Property Watch, and in a mutually prepared Q&A, he described some of KIPO’s policies and future plans, collaboration with WIPO, international partnerships, and regional efforts toward global harmonisation. KIPO Acting Commissioner Kim, Tae Man with WIPO Director General Francis Gurry at the WIPO General Assemblies this week. 1. Thank you for taking the time to meet with IP-Watch. To start, please tell us about some key policies KIPO has been implementing and also talk about upcoming policies or projects that KIPO plans to push forward? We are now facing a paradigm shift that we call the Fourth Industrial Revolution (4IR). It is a critical moment to redefine the direction of IP policies in order to adapt to the changing internal and external circumstances. The Korean Intellectual Property Office (KIPO) announced last November its “Intellectual Property Policy Direction for the Fourth Industrial Revolution” as the Korean government’s master plan for the IP sector. As we entered the 4IR era, this policy was aimed at establishing a platform for a virtuous cycle of IP creation, protection and utilization to create profitable strong IP which can be properly protected in the market and fully utilized. In turn, these elements lead growth and innovation. According to this master plan, KIPO will be an office that leads growth and innovation by creating a virtuous cycle for the creation, protection, and utilization of IP. To this end, KIPO will strive to secure strong, high-quality patents to have competitiveness in key technical fields of the 4IR such as artificial intelligence (AI) and the Internet of Things (IoT). Furthermore, in a preemptive effort, KIPO will also improve IP laws and systems so that newly emerging technologies of the 4IR such as AI and big data can be effectively protected within the framework of IPRs. 2. KIPO is currently attending the WIPO General Assembly. Can you briefly tell us about your plans for KIPO-WIPO cooperation? In the previous year, KIPO recorded the 5th highest amount of PCT applications filed with a total of 15,763 applications. Considering that PCT fees account for about 72% of WIPO’s total income, Korea has an important role in the operation of WIPO by contributing a significant portion of WIPO’s finances. KIPO, as one of the world’s leading IP offices, will continue to cooperate with WIPO in areas such as setting global standards and patent-related automation systems. Last May, KIPO signed an MOU with the WIPO Arbitration and Mediation Center. Accordingly, KIPO is committed to raising public awareness on mediation and arbitration, and promoting the use of Alternative Dispute Resolution (ADR) both at domestically and internationally. Additionally, KIPO and WIPO signed a technology transfer agreement concerning neural machine translation technology during a meeting on Artificial Intelligence (AI) for IP administration. Users abroad will be able to easily access KIPO examination information. 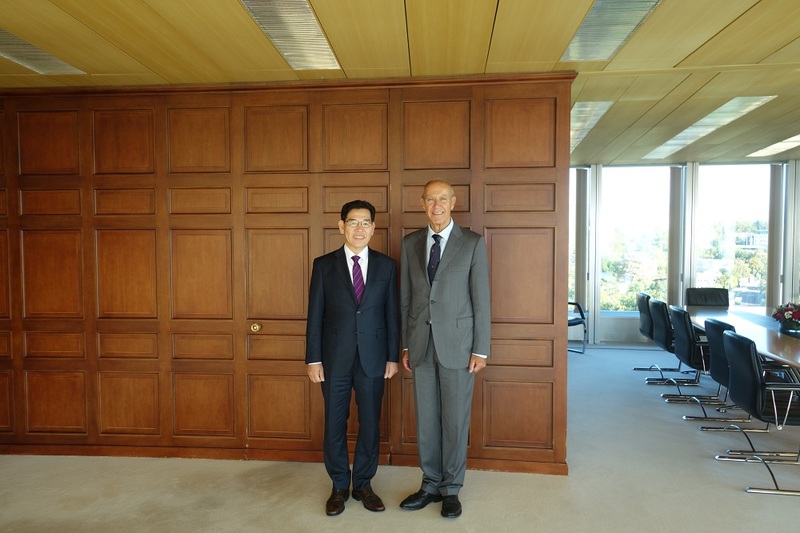 Furthermore, KIPO is putting various efforts, including communicating with WIPO Member States, in order to establish its External Office in Korea. A WIPO External Office in Korea will have many benefits including boosting potential of the IP systems through enhanced services for users, support for PCT applications, and efficiency in KIPO-WIPO cooperation projects. 3. We have been told that along with jointly managing the “WIPO Korea Funds-in-Trust” with WIPO, KIPO independently carries out “Global IP-Sharing Projects” in order to provide aid and support to developing countries. Could you explain more about both activities? Through the “WIPO Korea Funds-in-Trust” and “Global IP Sharing Projects,” KIPO is seeking to narrow the IP divide among developed countries and developing countries. As of this year, KIPO has contributed 12.1 million CHF in total to WIPO since 2004, and has supported building capacity and awareness of IP in developing countries through a wide range of projects. KIPO has been steadfast in this mission by continuing to host Appropriate Technology Competitions, create IP educational contents, operate training programs for IP experts from developing countries, and dispatch our IP experts to developing countries. In addition, KIPO’s “Global IP sharing projects” have helped developing countries and less developed countries solve problems encountered in everyday life through Appropriate Technology (AT) development, and adding value to locally produced goods through brands development. Under the “WIPO Korea Funds-in-Trust”, KIPO has held 18 Appropriate Technology Competitions since 2011 throughout Asia, Africa, and Central and Southern America to raise awareness of IP in developing countries. This year, noteably, KIPO hosted a launch of an Arabic version of “Getting Creative with Pororo” and premiered its two new episodes during this General Assembly period. KIPO plans to continue developing and distributing IP educational materials utilizing animations and mobile apps in a various languages. And in doing so, bridge the gap between developed countries and developing countries. 4. What has been achieved through KIPO’s efforts for bilateral cooperation so far, and what plans are there for future cooperation? The goal of bilateral cooperation is usually to enhance examination quality of both offices and enable users to efficiently obtain IP rights in a foreign country. It was with this view in mind that KIPO has bilateral talks with 8 offices during this WIPO General Assembly. KIPO signed a Memorandum of Understanding (MOU) on the Patent Prosecution Highway (PPH) with the Eurasian Patent Organization (EAPO) to simplify procedures when obtaining patents in foreign countries. The MOU signed between KIPO and the Brazilian Patent and Trademark Office (BPTO) aimed to enhance examination quality through cooperation between the two offices. It was also an meaningful event when KIPO, the State Intellectual Property Office (SIPO), and the Japan Patent Office (JPO) formed a new framework of cooperation between the Trilateral IP Offices (TRIPO) during the IP Heads Meeting last December. The three offices agreed to conduct collaborative research concerning IPR protection in the 4IR era, and to deliberate on new directions for cooperation corresponding to the needs of the three IP offices. While maintaining current cooperation with other offices, KIPO is looking to strengthen cooperation in IP with emerging countries and developing countries. 5. What significance does the IP5 cooperation have, and what was achieved this year? A meaningful achievement of the IP5 meeting held this year in the United States was the decision to start a “Collaborative Search Pilot (CSP)” program for PCT filings. It is the first time that five different IP offices will simultaneously carry out examination of the same patent applications. This collaboration is also significant because the IP5 is a forum of the five largest IP offices in the world (USPTO, SIPO, EPO, JPO and KIPO) that handles more than 80% of the world’s patent filing. Since the five IP offices have individual strengths and weaknesses with “language” and “databases,” it is possible to provide far higher quality examination services than before. Another achievement of the IP5 meeting is that strengthened cooperation between the Offices regarding 4IR-related IP issues. A consensus was reached to create subcategories of the patent classification for emerging 4IR technologies. KIPO submitted a new proposal to enhance the framework of the IP5 and further discussions will be held to improve its efficiency. Next year, Korea will be the hosting country for the IP5 Heads Meeting (to be held in Songdo, Incheon). In this context, KIPO will continue to contribute to the growth and success of the IP5. 6. In February of this year, the UAE [United Arab Emirates] launched the service of the Patent Administration Information System which was developed based on the KIPOnet system of Korea. Are there any plans to further expand overseas export of IP services? Since 2006, KIPO has exported and distributed IP administrative services, especially in areas of examination, education, and IT system, which we now expanded to include IP-related consultation. In collaboration with Korea, the UAE government established an IP automation system to manage all aspects of patent administration online. The utilization of the system recorded more than 97% for electronic filing and has been favorably received by the UAE. Along with the export of the IP automation system, KIPO is providing services such as PCT international search and patent reclassification, and dispatching KIPO examiners to the UAE. We have been providing patent administrative information systems to Mongolia, the Republic of Azerbaijan, and the African Regional Intellectual Property Organization (ARIPO) utilizing Korea’s Official Development Assistance (ODA). Based on the successes of cooperative efforts, KIPO plans to promote export models such as comprehensive IP consultations. Initially, we will provide support to targeted less developed countries in order to establish IP infrastructures such as consultations and education on IP. Once an amicable cooperative relationship has been built, we can offer providing services such as IP-related consultations. KIPO will continue to expand export of patent administrative services including PCT international searches. 7. Many people hold the view that one of the key components to becoming an IP powerhouse and fostering businesses lies in the creation of strong patents. What are policies at KIPO for supporting the creation of such patents? In order to produce patents with global competitiveness, KIPO will expand patent quality control to all stages of patent application and registration starting from R&D, and cooperate with related entities such as industry, academia and research institutions. First, we will improve quality of inventions in order to secure original, high-quality, and core patents at the R&D stage. To do so, KIPO will use its competence in patent classification to provide support for emerging technologies of the 4IR field, and will increase support for big data analysis throughout the entire R&D stage. Next, in order to transition superior inventions into strong patents, KIPO plans to help improve the quality of patent applications for promising applicants at the filing stage. We will provide concentrated support to universities and public research institutions for superior inventions with market potential, and create IP funds for supporting SMEs and startups to build their patent portfolio. Finally, we will improve examination quality by providing high-quality examination services for 4IR technologies at the examination stage. Specifically, we will create new examination divisions specialized in such technologies and implement a system of consultative examinations responsible for convergence technologies. 8. We understand that KIPO is taking the initiative to protect the technological innovations and ideas of small and medium-sized enterprises (SMEs) and startups. What policies has KIPO implemented to achieve this objective? It is important to properly protect and promote the technologies and ideas of SMEs and startups in order to achieve innovation. So, KIPO has revised relevant laws to prevent the unauthorized use of ideas. The theft of ideas constitutes unfair competition, and the affected parties can seek civil remedies accordingly. Furthermore, KIPO strengthened its authority to investigate and recommend corrective measures for unfair competition practices in order to quickly remedy damages suffered by SMEs, who often lack capacity to take legal action. KIPO is also looking to introduce a punitive damage compensation system that increases the damage award for infringement on patents or trade secrets with malicious intention. In addition, in order to strengthen the ability of SMEs and startups to manage lawsuits, KIPO plans to introduce the Patent Mutual Aid (2019) which will provide financial assistance and consultation to SMEs for patent disputes. "Interview With The Korea IP Office’s Acting Commissioner" by Intellectual Property Watch is licensed under a Creative Commons Attribution-NonCommercial-ShareAlike 4.0 International License.